The Cardinals keep rolling right along tonight completing their 7th undefeated February in the last 100 years as they easily take care of business against Temple beating the owls 88-66. The Cardinals (24-4, 13-2) have now won seven straight and will be heading to #21 Memphis on Saturday. This team is starting to look like a typical Rick Pitino team this time of year. Louisville fans have always enjoyed the month of February and March knowing they are going to see their team play the best basketball of the season. Our guys are playing with a purpose right now and are having fun in the process. Pitino on his team: “I think they like each other. I think they have a good time. We’ve been blessed with great chemistry for 3 years.” They are exciting from a fundamental standpoint as well. They had 9 turnovers tonight and this is the seventh game straight that they’ve had single digit turnovers. They have 14 single digit turnover games this season. Pitino: “This is not a selfish team in any characteristic. It’s what we believe in.” Tonight the Cards had 17 assist on 32 made baskets. Pitino: “It seems like we’re a better offensive team this year than last, and I’m not sure why that is.” The Cards shot 53% from the field and 40% from three tonight. They had great ball movement and it gave them some good looks. The Cards had three guys in double figures tonight. And these guys were 25 of 34 from the field and nearly outscored Temple all by themselves. Russ lead the way with 24 points, 3 assist and 4 steals. He moved to eighth on Louisville’s all-time scoring list tonight, and also passed Darrell Griffith in career steals tonight for 2nd place all-time. He is stepping up and leading this team at the right time. Montrezl continues his great play and had 21 points, 6 rebounds and 2 blocked shots. He has provided a big lift to this team with his aggressive play, but will need to improve on his performance at the free-throw line. He was just 3-7 tonight. Terry Rozier has been getting better and better and continues to look like one of the best freshman in the country. Tonight he was 8-10 from the field and scored a career high 19 points. This was his fourth straight game scoring in double-digits, averaging 14.8 points per game the past four games. He has a 5:1 assist to turnover ratio, and has played over 530 minutes this season and only committed 15 turnovers. It’s all coming together Cardinal fans. Momentum is building and it’s looking more, and more like this team is going to make a decent run at this thing again. The team has taken a huge step forward in the last few weeks, but it’s what they do in the next 3 games that will say a lot about just how far they can go. I know it’s been a lot of fun and I’m excited for the post season. My beard is itchy but it’s all worth it. No Shave Till Dallas! Go Cards! Our surging Louisville Cardinals return to action tomorrow night to face the Temple Owls for the second time this season. The game will be shown on ESPN 2 at 9PM. The Cardinals played the Owls a few weeks ago on Feb 14th after the game had been postponed due to a winter storm. Louisville won that game 82-58. These teams don’t really have a long history and have only met six times overall with Temple holding the advantage 4-2. 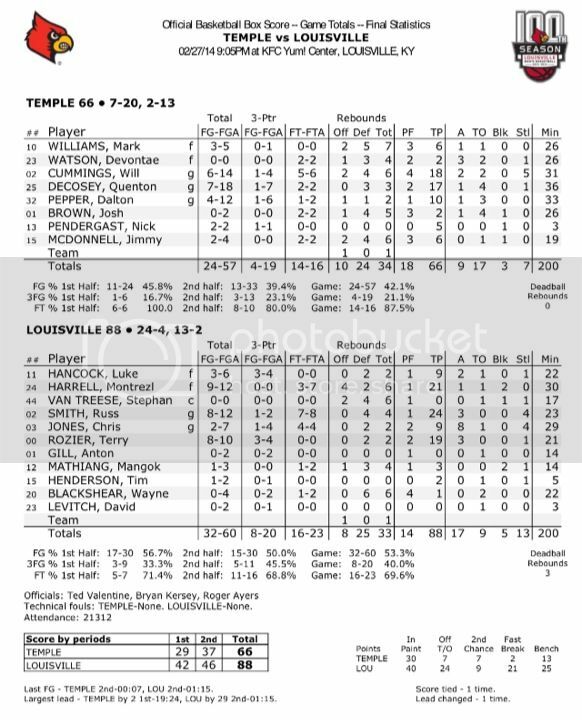 Temple (7-19, 2-12) is coming off a narrow overtime loss at #22/24 Memphis on Feb. 22, while the Cardinals (23-4, 12-2) come into the game having won six straight. Temple has a history of being a good program and their fans are used to 20+ win seasons and good basketball. Those days seem like a like a long time ago and a team that was once thought to contend for the AAC title has struggled most of the season to get wins against anyone in the conference. But they have started to show some signs of life in the last couple of weeks beating #23 SMU and taking #22 Memphis to Overtime in their last game. Temple is one of only six teams in Division I to have four players averaging 13 or more points per game, and the Owls’ top four scorers, who have accounted for 83 percent of the team’s points, produced just 26 percent of last year’s total points. Their offense has started to be more consistent, but they are still struggling to find the consistency they once had with their feard match-up zone defense. The Owls are lead by Dalton Pepper (17.2ppg, 5.1rpg, 2.3apg), Will Cummings (16.3ppg, 3.2rpg, 4.3apg), Quenton DeCosey (15.2ppg, 3.7rpg, 2.3apg), and Anthony Lee (13.8ppg, 8.8rpg, 0.8apg). Pepper is 4th in the AAC in scoring, 2nd in the AAC in three pointers made and 10th in the AAC in three point percentage. Cummins is 5th in the league in scoring. DeCosey is 9th in the AAC in scoring and has had double figure scoring in 20 of 22 games. Lee leads the conference in rebounding, and has 10 double-doubles on the season. These guys are getting it done but not getting much help from the rest of the team. Temple comes into Thursdays game averaging 73.2 points-per-game, while shooting 42.6% from the floor and 34.5% from 3-point range. The Owls are converting 69.8% of their attempts from the free-throw line. 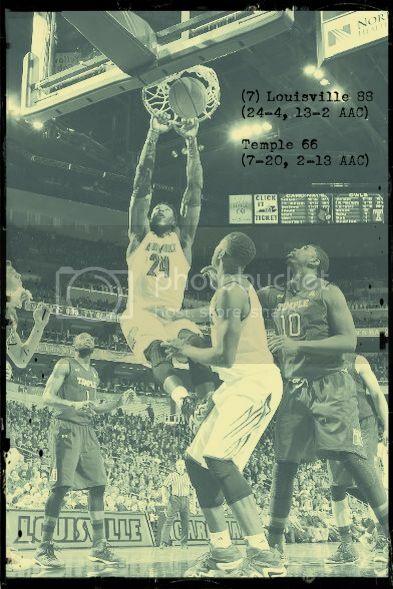 Defensively, Temple is allowing 77.2 points-per-game as the opposition is shooting 47.1% from the floor. The Owls are getting out-rebounding by their opponents 989-927 with a rebounding margin of -2.4 averaging 35.7 boards-per-contest. Our Cardinals are on a roll and the first game against Temple is when things really started to come together for this team. The Cards also have four players who average in double figures in scoring, led by Russ with 17.5 ppg (3rd in AAC) and Montrezl with 13.0 ppg to go with a team-best 8.2 rpg (3rd in AAC). Terry Rozier is also a player that is starting to emerge as a solid contributor in many ways. And other guys are filling their roles nicely. The Owls are running into a buzz saw on Thursday night, and it won’t be too much fun for them. The Cardinals will use this one as a tune-up for the big game coming up on Saturday at Memphis. No Shave Till Dallas. Go Cards! 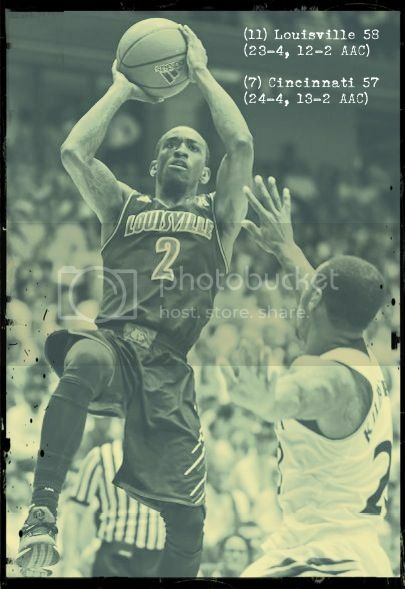 Russ Smith hit a clutch shot this past weekend to beat arch rival UC at the buzzer. 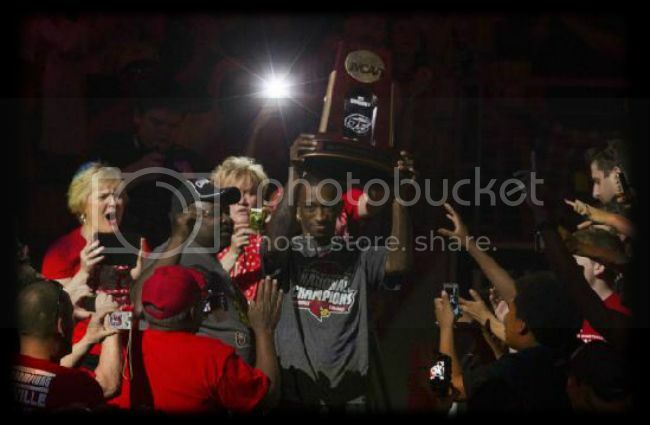 It’s one of those moments that Louisville fans will remember forever. He has also been racking up the mid-season honors; in just the last few weeks being named one of 30 mid-season finalist for the Naismith Player of the Year Award, and was added to the finalist list for the Senior CLASS Award. Russ has also moved himself into the top 10 in the Louisville record books in several categories including #10 in Scoring, #2 in steals, #10 in FG attempts, and #4 in made free-throws. This season he is averaging 17.5 points a game, 4.5 assist a game, and 1.9 steals a game to lead the team. Russ had a dream season last year for our Cards and was arguably the best player in the country. He averaged 18.7 points per game while shooting 41.4% from the field, 2.9 assist per game, 3.3 rebounds per game and 2.1 steals per game. His regular season success carried over into the post season scoring 134 points in the NCAA tournament to help lead the Cards to a National Title. He now has 196 career points in the NCAA Tournament, 5th most in Louisville’s history. As coach Pitino said in his post game comments after the USF game. Russ has two Big East titles, back-to-back Final Fours, and a National Title. What other senior in the country can say that? This coming from a player who didn’t play in 10 of the Cardinals’ final 13 games as a freshman and a former 2 star recruit coming out of high school. Things got so bad for Russ during his freshman year that he was thinking about leaving the Louisville campus until former Cardinal Rakeem Buckles talked him into giving it a second chance. Russ took his good friends advice and decided to make the best of his opportunity. And make the best of it he has. His name will now be etched forever in Cardinal lore. It’s not very often that you get to see a player like this come from virtually nowhere to become a superstar, but that’s what has happened during Smiths four years of college basketball and it has been great to witness such an extraordinary rise. If it weren’t for a Louisville roster depleted by injuries two seasons ago, Rick Pitino might have never been forced to figure out a way to best utilize the available pieces he did have. One of those pieces was Russ Smith, and the way Rick figured out how to utilize Russ’s skills and off set his weaknesses was nothing short of coaching genius. Russ also deserves a lot of credit for the hard work and dedication he has put in over the last three years to reach that max potential. Hopefully he will add the title of Back-Back-to-back NCAA Champion and All-American to his resume in April. Regardless of what the outcome of this season will be the fact still remains that Russ went from 2 stars to superstar a meteoric rise to fame that we may never see again. As the basketball season winds down over the next couple of weeks enjoy watching and cheering for this kid who has poured his heart and his soul into the team, the University of Louisville, and the city of Louisville. 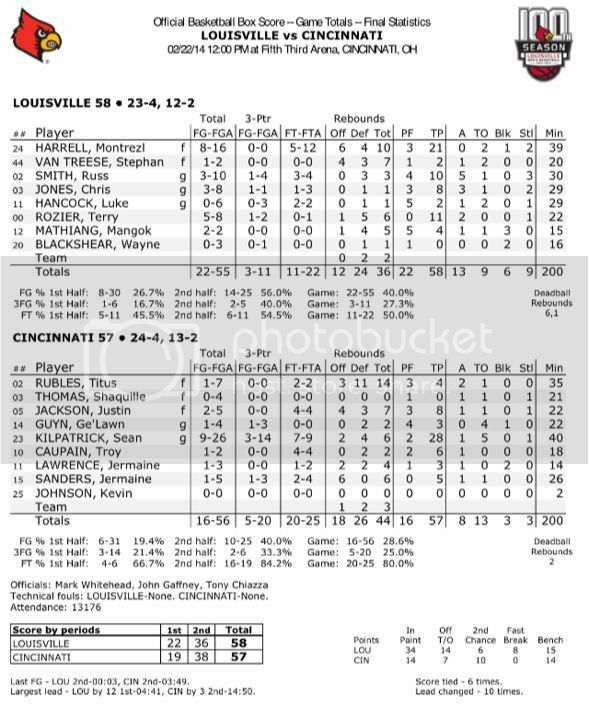 It was the end of the regular season rivalry between Louisville and Cincinnati. And the 99th meeting between these teams would not disappoint. Joining the football team the Cardinals basketball team took the final game on Cincys home turf beating the Bearcats in an instant classic 58-57. The regular season series ends with the Cardinals leading 56-43 spanning the Metro Conference, Missouri Valley , Conference USA, Big East and AAC. Cards now move into first place in the AAC at 12-2 and 23-4 on the season. When we look back on this season it is that 9 day lay-off that was the turning point. Before that break the Cardinals were struggling to find their defensive identity, players weren’t certain of their roles and they were struggling to find any consistency. Since that break they are 4-0, players have settled into their roles on the team, they have moved back into the top 10 of offensive and defensive efficiency ratings, and have been playing with a sense of purpose. A team that we were wondering if they could win a few games in March now looks like a group that could defend their title. I said from day one when Terry Rozier committed to play for the Cardinals that he was going to be something special. I’ve followed this kid on his journey to Louisville and he has lived up to every expectation I had. He was the difference maker today and without him on the court Louisville wouldn’t have won this game. This kid is one of; if not the premiere freshman in college basketball. He leads the Louisville offense like he’s played for four years. After today it is very clear that he is our best option for point guard going forward. He played 22 minutes today shot over 60%, had 11 points, 6 rebounds, 1 steal, two assist(including game winning) and didn’t have any turnovers. In 536 minutes played this season he only has 15 turnovers. Unreal for a freshman. I get giddy when I think about this kid as a sophomore. Montrezl Harrell is also a kid that has grown up before our eyes. He has also become one of the premiere big men in college basketball. Today he had his 7th double-double of the season leading the way with 21 points and 10 rebounds. We better enjoy these next few weeks with him because he will be headed to the NBA next season. And you can’t say enough about the production Mango and VanTreese have provided in that 5 spot. Coach Pitino said that in order for this team to have a shot that it would have to be these guys who stepped up their games. They have answered his call and have had 35 rebounds and 33 points in the last four games. Drastic improvement from these guys especially Mango who is really starting to play more aggressive. Last but certainly not least is the player that I’ve had more enjoyment following and watching than any other in my lifetime Russ Smith. I am a firm believer in Karma and today our Hero got some good as he was able to hit the game winning shot. This guy has given his heart and his soul to the University of Louisville and in a era of the one and done has proven that it can still happen the old fashion way. He epitomizes the Louisville First brand and he deserved that moment today more than anyone. I am really gonna hurt when we have to tell him good-bye in a few weeks but it’s been a helluva ride. He finished today with 10 points, 3 rebounds, 5 assist, and 3 steals. Man what a game! A fitting end to what has been an incredible series. Our grandfathers, fathers and now we have got to watch the Cardinals and Bearcats do battle. I hope that this rivalry can continue in the future so my son can also watch these teams go at it. College sports are all about rivalries and this is one of the best. 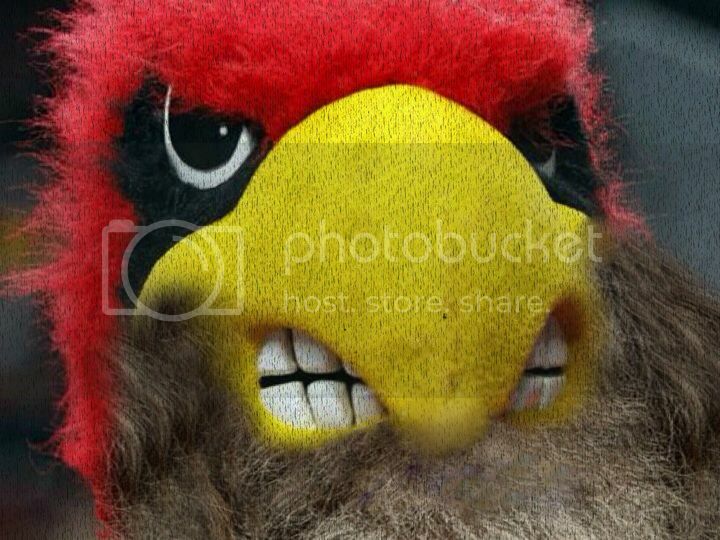 The beards keep growing and it’s on to the next as the Cardinals look to run the table and possibly still claim that number one seed. This was a great win today folks. Enjoy the rest of this day and wear that Cardinal gear with pride. No Shave Till Dallas! The Yum Center crowd roars when the PA announcer says David Levitch’s name before checking into a game. The Louisville fan base has welcomed this young man to the Cardinal Nation this year and he has become an instant fan favorite. He plays with a lot of passion taking full advantage of his minutes on the court in the closing minutes of games. But it wasn’t David Levitch the player getting that roar from the crowd on Friday night; it was “The David Levitch Play”. 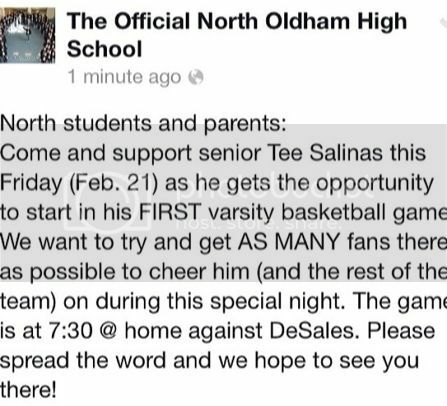 North Oldham high school made the official announcement on Tuesday that Tee Salinas a senior manager for the basketball team would suit up for the first time with the Mustangs on Friday night. Tee has been rebounding basketballs, getting water, passing out towels and supporting his Mustang basketball team since he was in the 6th grade, but on Friday night he would get his moment. He would be in the starting line-up and have his teammates cheering his name. And when Tee found out that he would have a play created for him to score he decided that he was going to call it “The David Levitch” his favorite Mustang player. David was a star at North Oldham high school where he still holds the three point record. You often hear about how kids these days don’t get it, and they have been given the name “The Me Generation”. This year has been full of moments like the one that happened at North Oldham high school Friday night and there is nothing “me” about it. Some of the most inspirational things I have seen this past year have been on high school basketball courts across the country in gestures made by high school kids. I don’t know about you but that really has restored my faith in the next generation. The player David Levitch left his mark on the basketball court at North Oldham high school, but it is the “David Levitch Play” on Friday night that left a mark on Tee Salinas’s life that he will never forget. Kudos to those kids on both of those teams and to those fans for inspiring us all. You have made us all very proud. Congrats to Tee on his big moment. May his life be blessed with many more. David Levitch sent out his special message to Tee on his Instagram Account. You can bet that when Louisville and Cincinnati play each other on the field, basketball court or wherever that it’s going to be a battle. If you add to that natural competition two highly ranked teams, playing for a conference title then you have something really special. This is the Cardinals oldest rival and the game on Saturday will be the 99th meeting in the UofL and UC series. It dates back to Metro Conference, Missouri Valley , Conference USA, Big East and now AAC. Louisville leads this series with our old foes from the north 55 to 43, but lost a heart breaker to the Bearcats back on January 30th 66-69. Cincinnati improved to 24-3 overall and 13-1 in the AAC on Wednesday with a win over UCF, and are ranked 7th by AP and 9th in the USA Today poll. Our Cardinals have won 9 out of the last 10 and five straight heading into the game on Saturday at 12PM on CBS. Coach Mick Cronin has one of his most physical and athletic teams coming into the game on Saturday. Cincinnati is among the national leaders in five key defensive statistics including scoring defense (57.7, fifth nationally), turnover margin (+3.7, 13th), scoring margin (11.7, 25th), field goal percentage defense (38.7, 27th) and blocked shots (5.7, 25th). It will be an experienced and established UC team lead by Sean Kilpatrick (20.2 ppg, 4.4 rpg, 2.6 apg), and a great supporting cast of characters including Titus Rubles (7.1 ppg, 6.1 rpg, 2.1 apg), Shaquille Thomas (7.1 ppg, 2.9 rpg, 1.1 apg), Jermaine Sanders (5.9 ppg, 3.3 rpg, 1.0 apg), Troy Caupain (5.7 ppg, 2.4 rpg, 2.4 apg), and Justin Jackson (11.4 ppg, 7.0 rpg, 1.7 apg). These guys can all protect the rim and rebound. Kilpatrick is their do it all guy and their go to. He was named to the Naismith Trophy Midseason Top 30 list, leads the American in scoring and three-pointers made (2.8 per game). Titus Rubles is ranked eighth in the American in rebounding since the start of league action. He has pulled down at least six rebounds in 10 of UC’s last 14 contests. Justin Jackson entered the week ranked eighth in the nation in total blocks (81). He is listed among the league’s Top 10 in five categories: blocks (first at 3.1), offensive rebounds (second at 3.2), field-goal shooting (fifth at 57.0 percent), rebounds (t-fourth at 7.0) and steals (seventh at 1.7). He’s the key to a Cincinnati defense only allowing opponents to 57.4 points a game. UC comes into Saturdays game averaging 69.7 points-per-game, while shooting 43.3% from the floor and 34.4% from 3-point range. The Bearcats are converting 71.5% of their attempts from the free-throw line. Defensively, UC is allowing 57.4 points-per-game as the opposition is shooting 39.3% from the floor. The Bearcats are out-rebounding their opponents 973-851 with a rebounding margin of +4.5 averaging 36 boards-per-contest. UC is off to their best start in coach Cronin’s eight-year tenure. He is a guy that embodies the leadership, courage and determination of all of his mentors. And he has passed that down to his team. They are relentless on the defensive end of the floor and they dig in to grind on teams for the full 40. This Cardinals team will also be much better the second time around. In the last game there were a lot of mistakes, defensive breakdowns coming off screens, closing out, and defensive rebounding. The Cards still almost managed to get the win regardless. UC will see a more disciplined defensive team Saturday, a better rebounding team and wiser team. Players like Montrezl and Rozier are emerging into difference makers. Mango and Stephan have produced 23 rebounds and 27 points in that 5 spot over the last two games. Russ has made his mind up to just win games instead of trying to please everyone and Chris Jones has settled into his role on the team. Factor in Luke Hancock back to being “Luke” and I think it spells success on Saturday for the Cards. I’m not homer enough to think our guys are gonna walk into UC’s gym and get an easy win. It’s going to be a fight and I expect a very close game throughout. But this time when our guys need that last rebound, that last play to close out the game I think they’ll get it done. Folks I’m really looking forward to this one. It will be the game of the regular season. Let’s hope our guys return to Louisville Saturday with a little more facial hair and ranked 1st in the AAC. No Shave Till Dallas.. Go Cards!…. I’ve been writing about how Montrezl Harrell was close to breaking the single season dunk record for a couple of days now. 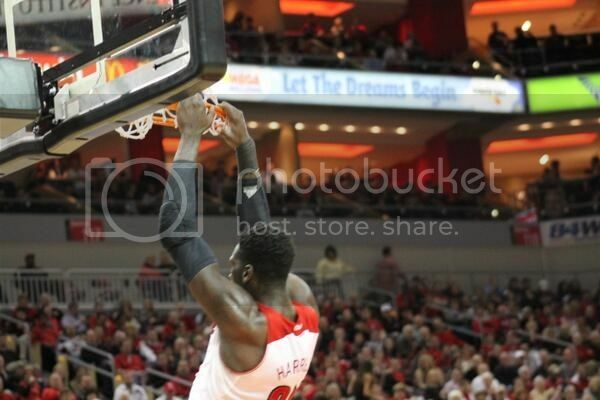 Well last light it happened in a flash as Montrezl slammed number 60 home on a play early in the first half. He would have three more monster dunks on the evening to add to the record that now stands at 63. Montrezl passed both Chane Behanan and Pervis Ellison who are now at number 2 with 60. Montrezl also continues to move up the list for dunks in a career. He now has 107 career dunks and has passes Rodney McCray at number 6 all-time. As the season winds down it is very possible that he could end up at number 3 all-time in career dunks a position now held by Alvin Sims with 123. It’s really special that Montrezl has had this many dunks with such limited playing time as a freshman. If he wasn’t a player who will more than likely take his game to the next level next season there’s no doubt he’d shatter all the dunk records. Even if he doesn’t hold the career record he will go down as probably one of the best Dunkers in Louisville’s history. Glad I got to be witness. The Cardinals didn’t miss a beat tonight and had their 5th blowout win in a row beating USF 80-54. Losing to the Cardinals in this fashion is something that the Bulls have gotten used to over the years. Louisville closes out this series with a 29-4 series advantage, and winning 15 of the last 16 match ups. The Cards who have won 11 of their last 13 games will take their hot streak on the road to play rival Cincinnati. It was another very good outing for the Cardinals who seemed poised and ready for their stretch run coming up. 4 guys were in double figures tonight with Russ Smith leading the way with 19 points. Pitino on Russ: “I’m hoping some people/scouts take note of what a dynamic player he is.” He really has transformed himself into an all around player and reemphasized tonight that he wanted to do whatever it takes for his team to win. With his 19 points tonight he passed Wes Unseld for 10th all-time in scoring with 1697 points. Another guy who continues to look better every time he plays is Luke Hancock. He was second in scoring tonight with 16 points. He is the backbone of the Cardinal offense and good things happen when the offense goes through him. Montrezl Harrell is now the single season dunk record holder with 62 after slamming home three monster dunks tonight in his 14 point effort. And my guy Terry Rozier continues to be amazing. Coach Pitino said tonight night that he would put Rozier right with the other elite freshman in college basketball this season. “I think Tyler Ennis is having as good a year as any guard in the country, and I think Terry Rozier is in his class.” He would score 13 points tonight. Again tonight from a statistical standpoint the Cardinals were great. They had shot over 50% from the field in 4 straight games and 6 out of their last 8, overall. Tonight they shot just under that at 48%. They shot 53% from the field in the first half. Rebounding has gotten much better and they win that battle again tonight 36-30 against a good rebounding team. The Cards had 14 assist tonight on 34 made baskets, had 2 blocked shots and 10 steals. Louisville came into this game generating an average of 21.9 points per game off turnovers. Tonight they forced 20 turnovers and scored 20 points off them. Bench scoring continues to be very good tonight out scoring USF bench 29-12. Now the rubber will meet the road in the Cardinals basketball season. Four of the Cardinals final 5 games are against NCAA teams. At Cincinnati, at Memphis, at SMU, vs. UConn. It will be during this stretch that we will get some kind of idea of whether or not our guys can make another run at this thing. Coach Pitino said tonight “We’re about to go play in some tough, hostile places. That’ll get us ready for tournament time.” Let’s hope the wins keep piling up and the facial hair keeps growing on. No Shave Till Dallas! Go Cards! Our Cardinals will return to the Yum Center court for their third game in the last five days when they play USF on Tuesday night. The game is at 7PM and can be seen on the CBS Sports Network. 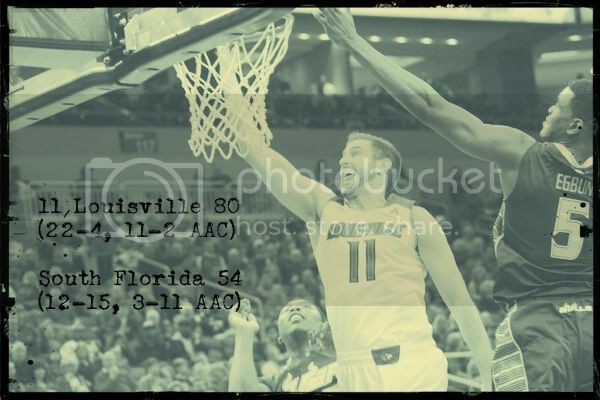 Louisville has a 28-4 series advantage over USF, winning 14 of the last 15 match ups. This is the second game if the season between these teams. The Cardinals beat the Bulls back in late January 86-46 down in Florida. The Bulls come into this game 3-10 in the AAC and 12-14 overall. The Cards have won 10 of their last 12 games including a 102-54 win against Rutgers on Sunday. USF isn’t a great team but Stan Heath is a good coach who knows that the strength of his team is the defense and blocking shots on the interior. Heath comes from the forty minutes of hell philosophy learned during his time at Arkansas and defense has been the identity of his teams while at USF. They had a solid defense last year but didn’t have the size down low to finish strong and gave up way too many offensive rebounds. Heath hit the recruiting trail this past summer and got some guys he had hoped would help. And 40.7 percent of USF’s scoring this season has come from three newcomers: Corey Allen Jr., John Egbunu and Chris Perry. Two of those young guys are leading his front-court this season. Chris Perry (9.5 ppg, 5.7 rpg) and John Egbunu (7.5 ppg, 6.3 rpg). They are joined in the front-court by the best player on the team Victor Rudd (14.9 ppg, 6.7 rpg). Perry has a 7-5 wingspan and is a traditional low-post player who likes to play around the basket. He ranks 15th in the conference in rebounding and leads all freshmen in the conference in scoring. Egbunu has speed, leaping ability and a willingness to attack the rim. He ranks 10th in the conference in rebounding, the most of any freshman, 11th in blocked shots, 8th in offensive rebounding . Rudd is a do it all athlete and a great all around player. He is one of three players in the American Conference to rank in the top 10 in scoring and rebounding. 10th in scoring, 9th in rebounding. They are led in the back-court by three veteran players. Corey Allen Jr. (9.9 ppg, 3.4 rpg), Martino Brock (9.4 ppg, 3.0 rpg) and Javontae Hawkins (4.1ppg, 1.3 rpg). Allen is a very active guard who knows how to use his hands and plays at a high level on both sided of the ball. He ranks 14th in assists (3.0), 16th in steals (1.4), sixth in minutes played (33.1). Brock is a lengthy guard who also has a knack for taking away the basketball. Allen and Brock combine for about 4 steals per game. Hawkins is a very good defensive player in his own right and is great at getting his team-mates invoked. He looks to drive a dish. USF comes into Wednesday’s game averaging 66 points-per-game, while shooting 43.3% from the floor and 25.6% from 3-point range. The Bulls are converting 67.1% of their attempts from the free-throw line. Defensively, USF is allowing 70.5 points-per-game as the opposition is shooting 43.8% from the floor. The Bulls are out-rebounding their opponents 922-919 with a rebounding margin of +0.1 averaging 35.5 boards-per-contest. 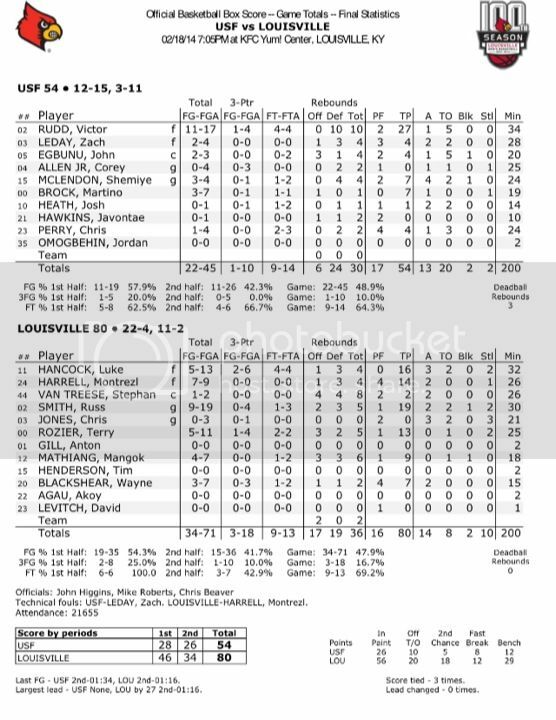 The last time the Bulls beat a ranked team was in Louisville, a 58-51 win over the No. 19 Cardinals on Feb. 29, 2012. And while I don’t think this team is as bad as they appear on paper I don’t think they have even the slightest of chances Tuesday night. Our Cardinals are playing the best basketball of the season right now and this will just be another tune-up for the big showdown in Cincy this weekend. This will be the final regular season conference meeting between these two schools and I can’t say that I’ll miss it. Cards romp and the facial hair continues to grow. Go Cards! Luke Hancock’s beard became a symbol of great superstition during the Cards 16 game winning streak and Championship season a year ago. Other players and fans including myself decided to grow out our beards in solidarity with Luke because we started to believe in the power of that magical facial hair. Last Friday Coach Pitino and his staff decided to throw caution to the wind and just maybe reclaim some of the mojo that the magical facial hair provided last year. The Coaching staff and the players agreed before Friday nights game against Rutgers that they would not shave again until they lost a game. Call it superstition or just call it a coincidence, but the Cardinals have played the two best and most complete games of the season since deciding not to shave.